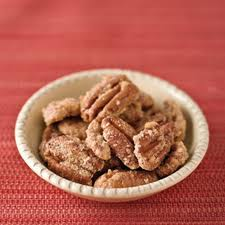 ADD PECANS AND STIR UNTIL COATED. MIX SUGAR TOGETHER AND SPRINKLE OVER PECANS. PLACE A SINGLE LAYER OF PECANS ON A BAKING SHEET. STIR HALFWAY THROUGH COOKING. COOL.